LIC is back with new insurance plan LIC Jeevan Sangam (Table 831).LIC Jeevan Sangam is non-linked, with profit, single premium plan. Jeevan Sangam is closed ended plan available to public for 90 days from 4th March, 2015. Let’s discuss about LIC Jeevan Sangam (Table 831) in detail. Under this plan, the proposer/life assured will have an option to choose the maturity sum assured and the single premium payable will depend on the chosen amount of maturity sum assured and age of the life assured. 10 times of premium along with loyalty addition if any shall be payable. For Aged 8 years or more, risk to commence immediately. For Age less than 8 years, risk to commence on completion of age is 8 years. Premium ready racknor or premium rates of LIC Jeevan Sangam Plan is given here. 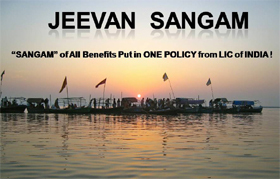 Should I Buy LIC Jeevan Sangam? Looking at first instance LIC Jeevan Sangam plan seems to have good option for risk cover. Just by paying 50,000 Rs/- one time you are getting risk cover of 5 Lac for 12 years. But I feel term plan is better alternative compare to LIC Jeevan Sangam plan where you can get very high risk coverage with low premium rate. 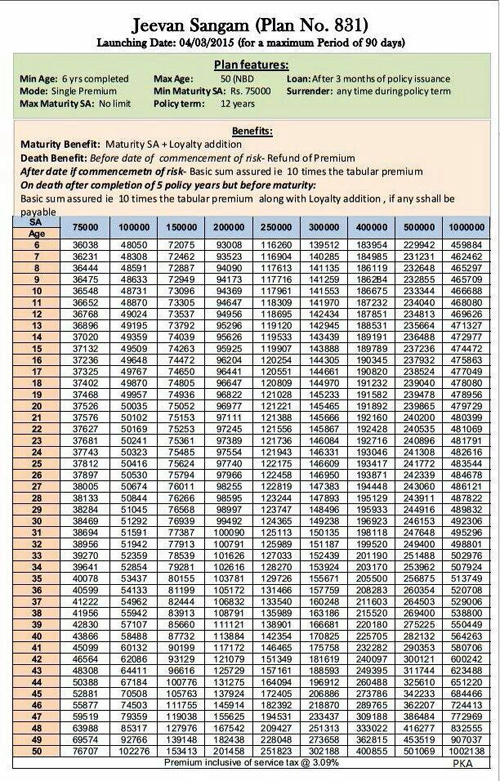 You can get term plan with risk coverage of 1 Cr at age of 25 years with yearly premium of 7000 Rs/-.So from risk coverage point of view it is big NO for LIC Jeevan Sangam. From investment return point of view this policy is likely to give return 6-7% on maturity, so if you are happy with 6-7% return LIC Jeevan Sangam is for you.